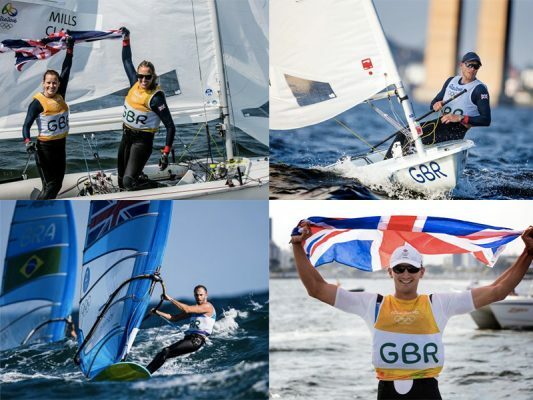 You are here:Home » Posts tagged "Southampton Boat Show"
Yachting Boating World: Southampton Boat Show organisers have announced the names of the Rio Olympics medal winners and athletes who will appear at this year’s show. Gold Medalists Giles Scott (Men’s Finn), Hannah Mills and Saskia Clark (470 Dinghy) and Silver Medalist Nick Dempsey (Men’s RS:X windsurfer) will make an appearance at this year’s Southampton Boat Show. Other stars to appear at Southampton Boat Show include TV actress Michelle Keegan, who’ll be sure to wow the younger crowds. This year’s event will see plenty of new yachts being launched and a new site layout which was unveiled last week. Sunseeker, Spirit Yachts, Ancasta, Beneteau, Jeanneau and Fairline Yachts are just some of the brands showcasing their new models. Southampton Boat Show 2016 takes place from 16-25 September at Mayflower Park. 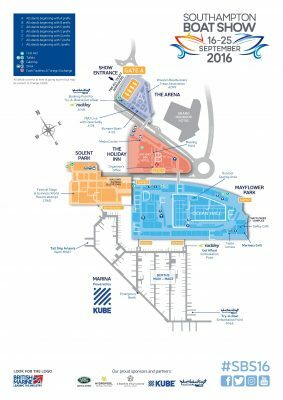 Yachting Boating World: With just over two weeks to go before the Southampton Boat Show 2016 kicks off, a site map of the show has been released. The countdown for this year’s Southampton Boat show has started! Sunseeker, Spirit Yachts, Ancasta, Beneteau, Jeanneau and Fairline Yachts are just some of the brands showcasing their yachts. Following unprecedented demand from exhibitors for undercover space, a new show layout has been revealed for 2016. Ocean Hall and Windward Hall will be merged with an additional 550 square metres of space added to create a new look Ocean Hall for 2016. Enhancements to the layout will also see Beneteau and Jeanneau move from their historical space on the land to a much bigger display on the marina. 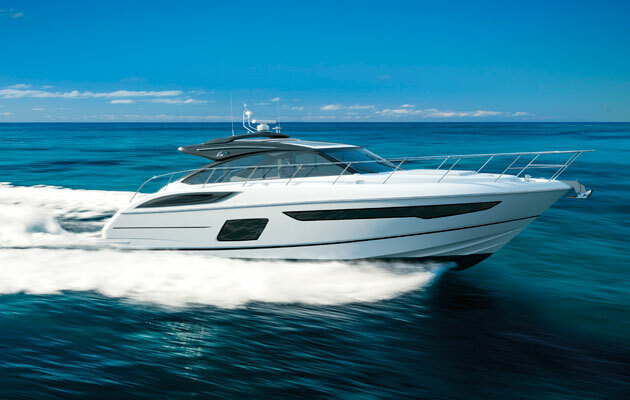 Sunseeker International will showcase its 95 Yacht at this year’s Southampton Boat Show. The 95 Yacht is as spacious and striking as its successful sister, the 28 Metre Yacht and it combines a superyacht feel with all the practical advantages of a yacht in this size category. A standout feature is its unique main deck layout with a special master cabin triplex configuration for even greater flexibility and space from a class above. With the luxurious master stateroom berth on the main deck, a forward staircase leads to a mid-level dressing area and sumptuous en-suite. The raised pilot house offers greater flexibility contributing to the more expansive main deck layout, remarkable for this size of yacht. Above deck, the spacious flybridge is well equipped with a second helm, bar, optional hot tub and plenty of seating for guests to be entertained in style. As with all Sunseeker’s new models in 2016, the 95 Yacht is based on the classic deep V hull with performance at its heart. Yachting Boating World: The 2016 Southampton Boat Show returns in September with world and UK launches, new brands and a new layout. Tickets are now on sale. Now in its 48th year, the Southampton Boat Show will return to Mayflower Park on 16-25 September 2016. The 10-day event will showcase thousands of boats, brands and equipment and will feature the very latest world launches from powerboats to sail. Confirmed for a world launch at the show are the Oyster 675, the Greenline 36, the Spirit 47CR, the Cormate Utility 23 R and the X4 and X6 from X-Yachts. The Antares 7 and Antares 8, Atlantis 43, Azimut 55S, Elling E6 from Q Marine (Poole), J/11S from Key Yachting, the Dehler 34, Fairline Yachts’ Targa 53 OPEN and its Squadron 65 HardTop and Charles Watson’s RM 1270 will have UK debuts. New brands already confirmed for this year’s show include Cormate and Waterspoor. Following unprecedented demand from exhibitors for undercover space, a new show layout will also be revealed for 2016. In total, Beneteau will be bringing 19 boats and Jeanneau 22 boats across their sail and power ranges. Also exhibiting for the first time will be Monte Carlo Yachts who will be showcasing the MCY 65. There will also be plenty of opportunities for visitors to get out on the water and experience dinghy sailing, power boating or taking a ride on a RIB. The magnificent Artemis tall ship will be taking centre stage on the marina, with visitors being able to climb aboard. The VIP Platinum Experience which includes a trip out on a luxury motor yacht. Motorboat & Yachting: The organisers of the Southampton Boat Show have claimed that the first weekend saw a 3% rise in visitors when compared to last year. 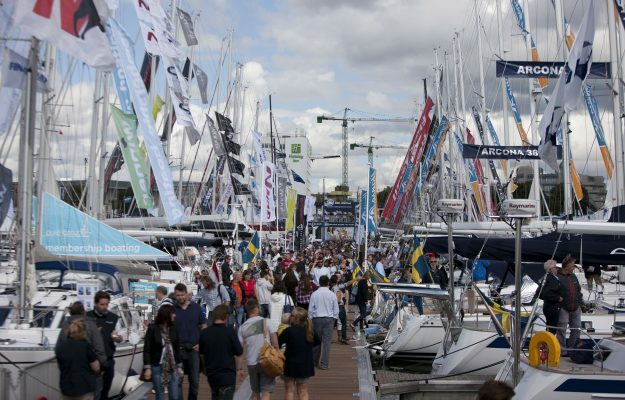 This year’s Southampton Boat Show has got off to a strong start, with organisers British Marine Boat Shows claiming a 3% rise in attendance over the opening weekend. The Southampton Boat Show attendance figures are even rosier when compared to 2013, which results in a 5% boost in attendance for Britain’s biggest boat show over the past two years. 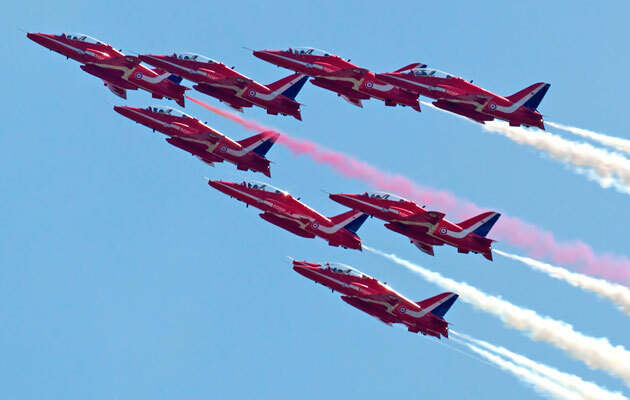 Highlights so far have included a guest appearance from Formula 1 presenter Suzi Perry, music from Britain’s Got Talent winners Collabro, and an aerial display from RAF stunt team The Red Arrows. And on the water, world premieres from Fairline Boats, Princess Yachts and Beneteau have further piqued the interest of boat lovers. However, with five full days still to come, the organisers were keen to stress that there is still plenty of attractions to lure visitors down to Mayflower Park, including the return of Ladies Day on Thursday (September 17). The boating industry has enjoyed a bumper show so far, with brokerage firm Clipper Marine selling three boats on Press Preview Day. Motorboat & Yachting: Sunseeker has announced its Best of Britain display for the Southampton Boat Show, including a San Remo wrapped with the Union Jack. 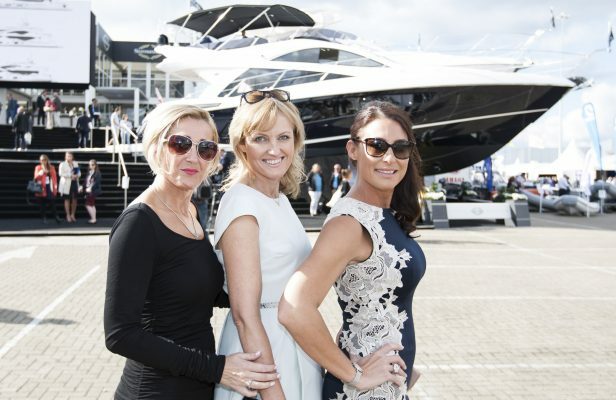 Sunseeker has announced that it will be celebrating the best of British design and manufacturing at the Southampton Boat Show which runs from 11th September until 20th September 2015. The Poole-based manufacturer will be bringing together a collection of high-end and luxury items from some of the UK’s most prestigious firms in a private exhibition. These will include a Mulberry handbag designed by Cara Delavigne, a Roger Smith watch, a Cleave decorative bowl and a portrait of The Queen by David Bailey. 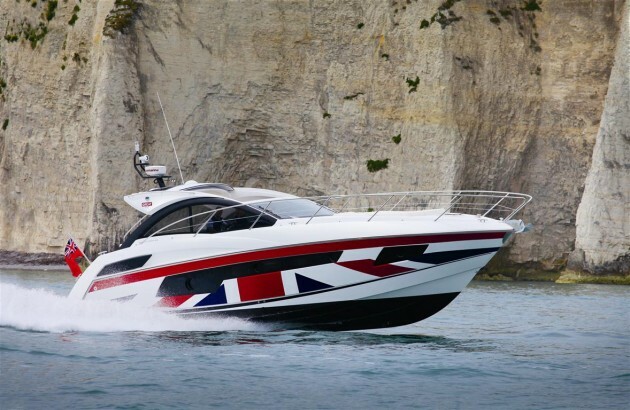 Continuing with the theme, the firm will also be exhibiting a Sunseeker San Remo sportscruiser deck out with a Union Jack vinyl hull wrap, which was created as part of the Government’s Britain is Great publicity campaign. This is not the first time that Sunseeker has flown the flag in this way – last year the firm wrapped a Portofino to celebrate the launch of the British Motor Yacht Show. Bryan Jones, marketing manager at Sunseeker, said: “The Southampton Boat Show is a real highlight of the international boating calendar and an opportunity for British brands to showcase the very best of what they have to offer to the world. In a break from tradition, Sunseeker International will not be launching a brand new model at this year’s Southampton Boat Show, after a busy year in which the firm launched the Predator 57, Manhattan 65 and 86 Yacht. However, a wide selection of motor yachts from the firm’s current range will be available to view, as well as plans for the 95 Yacht model. What’s more, Sunseeker Charters will be running a Platinum Experience, which includes access to a private hospitality lounge and a ride on a Predator 56. Motorboat & Yachting: The Plymouth yard has announced that it will be launching the Princess V58 Open as well as the S65 sportsbridge at the Southampton Boat Show. Princess Yachts has confirmed its line-up for the 2015 Southampton Boat Show, which includes two newcomers in the form of the Princess V58 Open and Princess S65. First details of the S65 emerged back in April, but the Princess V58 Open is a new development for fans of Princess Yachts. Highlights include a large forward hull window that has been designed to flood the lower accommodation areas with light. Meanwhile, the one-level main deck prioritises socialising space, with fore and aft sunpads in addition to a centre teak saloon table. Motorboat & Yachting: This year’s Southampton Boat Show is starting to shape up, with organisers confirming that the Red Arrows will be making a special appearance. 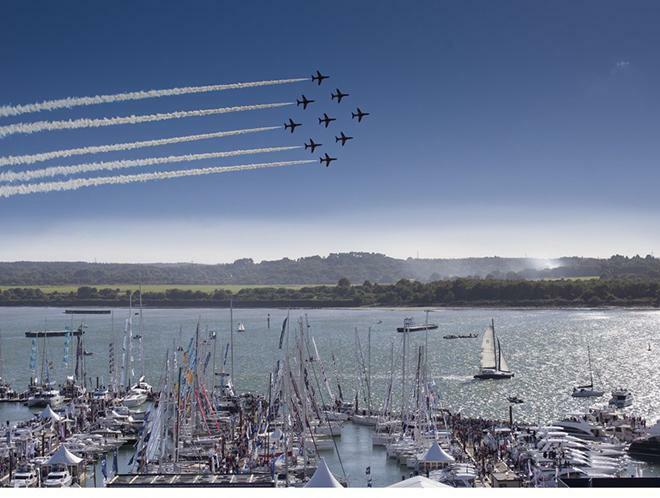 First details are starting to emerge about the 2015 Southampton Boat Show (from the 11-20 September), as the organisers have secured a major coup by lining up a Red Arrows flypast for the first time. The famous Royal Air Force stunt team will be performing their aerobatics above Mayflower Marina from 15:40 to 16:00 on Saturday July 12. Apart from the Red Arrows display, other key attractions include the 100ft Ferris wheel, which is returning for the second year in a row to offer visitors panoramic views of the show. Meanwhile, the historic tall ship Earl of Pembroke will be open for visitors to climb aboard throughout the ten-day event. Visitors will also be able to try out boating through various initiatives. Get Afloat will provide dinghy sailing and stand-up paddleboarding taster sessions for 8-16 year-olds, while Wet Wheels will be offering catamaran rides for wheelchair users. The show, which is now in its 47th year, features a purpose-built marina to house the hundreds of models that are displayed on the water. In terms of new models, big-name debuts from the likes of Fairline Boats, Sunseeker and Princess Yachts are expected, and a number of high-profile announcements are due in the coming weeks. Advance tickets to the 2015 Southampton Boat Show are on sale now, priced at £15 per adult. Two children aged under 15 can go for free with each paying adult. Motorboat & Yachting: Haines Marine has announced plans to revamp the flagship Haines 400, which will be relaunched at this year’s Southampton Boat Show. Norfolk manufacturer Haines Marine is planning to refresh its flagship motoryacht this year with the relaunch of the Haines 400. The original Haines 400 was launched in 2010, but following the recent success of the redesigned Haines 32 Offshore and Sedan, the yard has decided to carry some of this design language over to the largest model in the fleet. As a result, the new Haines 400 will get a stone grey hull and extra-long hull windows. Meanwhile the layout will include an aft owner’s cabin, VIP en-suite in the bows, raised aft cockpit, and a split-level saloon and galley. Most importantly, the new arrival will get the latest 4.46-litre Yanmar V8 diesel engines, generating 370hp on each side for a top speed in excess of 30 knots. Local dealer Norfolk Yacht Agency will be launching the new Haines 400 at the 2015 Southampton Boat Show, after which it will be displayed as a stock boat.